Styled with '90s karelis tank , mara short and swin waist bag . See this in Heathered fabric or with Vegan fill. Fits small! So size up!
. It has many pockets that are large and good for cards and can fit any size of phone which is convenient for someone who is on the go. Unlike other reviews I find that this jacket is true to size and I purchased a size small. I always fit shirts in a size small and extra small and I have the TNA Bancroft winter coat and fit a size small in that as well. This coat is like magic because it looks nice and form fitting over a thin long sleeve shirt, and it also looks nice and form fitting over my warmest hoodie. I find this jacket works best for weather between 0 degrees C and 5 degrees C. My only complaint is that the zipper is very small and finicky sometimes. I am 5'7, 135 lb and size 32D. I was pleasantly surprised by this jacket. The outer material is not the typical heavy, synthetic-like material but kind of soft. The jacket feels like it weighs about the same as a thin sweater but is wonderfully warm. I found myself reaching for it on most chilly days. Very warm, and fashionable. It did have a tiny whole though inside one of the pockets and it is a bit small even though I sized up as recommended. Most beautiful Super lightweight jacket ever!! Very warm, great quality! Perfect for many occasions ! Definitely recommend !! I definitely what this jacket it more colors! 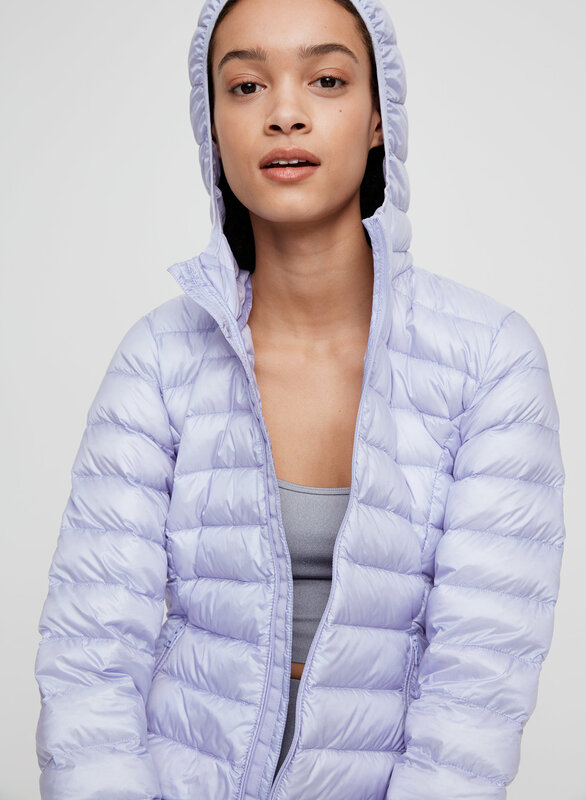 This puffer is a beautiful fit. M fits like S usually does for me. Arm length is great. Sagesse is a beautiful shade of green, and it is what I would expect Olive to look like. It is so light but hugs you with warmth. I love botanie puffer. This is my second one. Warm, light, stylish. I love the slim design. Looks better than TNA little puff. I have both. Plan to buy more in different colors. Fit small, I go two size up. Great colors and would recommend. Fits smaller so I suggest one size up. Very comfortable, lightweight, the perfect driving jacket, very delicate tears easily. I love it!!! It's so light but yet so warm! It is exactly what I need it!!! Love this jacket it is perfect for the days that you don't want to wear a big thick jacket. I would highly recommend going a size up if you plan to wear any kind of thicker sweater under it. I tried on both a S and M and found that the small was a bit tight it would be perfect if you plan to only wear a thin shirt under it. Love it just wish it was an inch longer ! The arm length fits great(I’m tall but slim) I didn’t want the long one (to the knee) because I already have a full length coat, I just wish it was like an inch longer in the body just for us long ladies! Otherwise it’s awesome i love it ! I picked a nice color with a great fit! 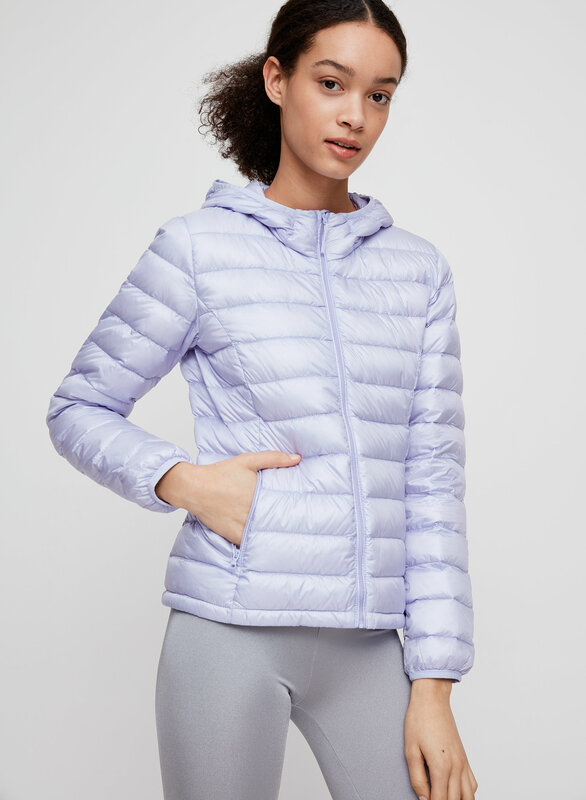 Wanted a featherweight style to go under my gortex ...perfect weight for added warmth as a base layer and can easily transform for use as jacket on warmer winter days ...great fit ...great price! Great colour , fits great over zip ups and sweaters . I really like the look of this jacket. I would typically get a size medium in a jacket like this and got the large due to the reviews. The large fits over top of my largest, thickest sweater so I probably could have made due with a medium if I'm just wearing something thin underneath (if it helps, I'm a 34C, 5'7" & 134lbs). I like the extra room though. It seems perfect for travel from cold to a hot climate since it squishes up into its bag (9" x 3.5" diameter when it's packed) and warm enough for getting from car to airport (it's very thin as others have said so it's only so warm). It makes my hair static-y but all down coats do that. Well made. Runs small and short. Certified down feathers used. The Botanie puffer is very well made. It came beautifully packaged in a beautiful Aritzia paper/ dust bag (The bag had a picture of an actual painting in front). The down is certified good quality. It runs small and short. But luckily I chatted with an Aritzia agent (Patricia) before hand and thanks to her sized up. I wear a XXS in designer brands, but sized up to a Small in the Botanie. For reference, I'm 5 ft 3 inches and weigh 109 lbs. 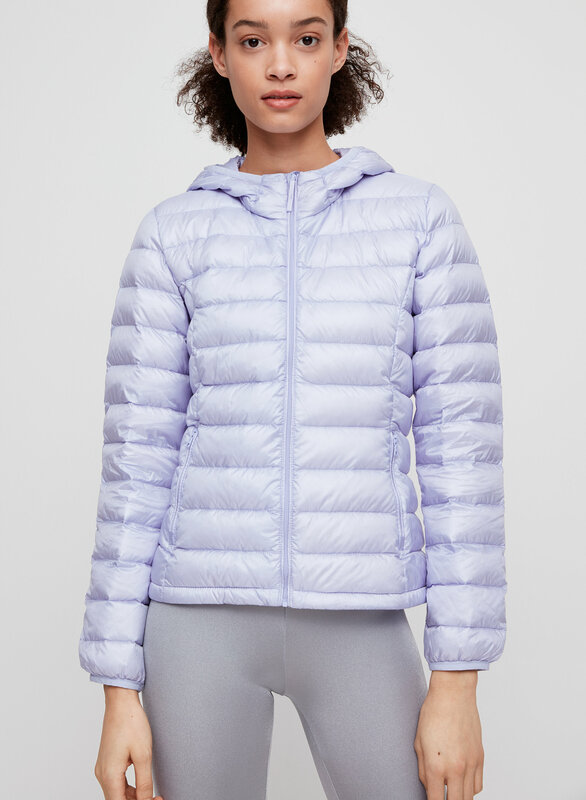 The puffer is very lightweight and I love it. It also comes with it's own packable bag attached to the side. This is my first Aritzia purchase and I love everything about it, the service, the convenience, the website, the product and the agents. Thank you Aritzia! i had to get a size bigger, because these jackets are actually pretty tight, but if you need a simple lightweight jacket i recommend!!! I really love the way it fits. It’s perfect for the days when it’s not so cold but you still need a jacket. It goes really well with tights. I also love that it has a hoodie :))) very satisfied with my purchase. Love everything about it, from fabric to warmth it’s amazing and very stylish! I found it to small around the chest. I thought it was just me. I bought my step- daughter one as well and she found the same thing. She much smaller. It fit perfectly every where else ?? Not sure why?? 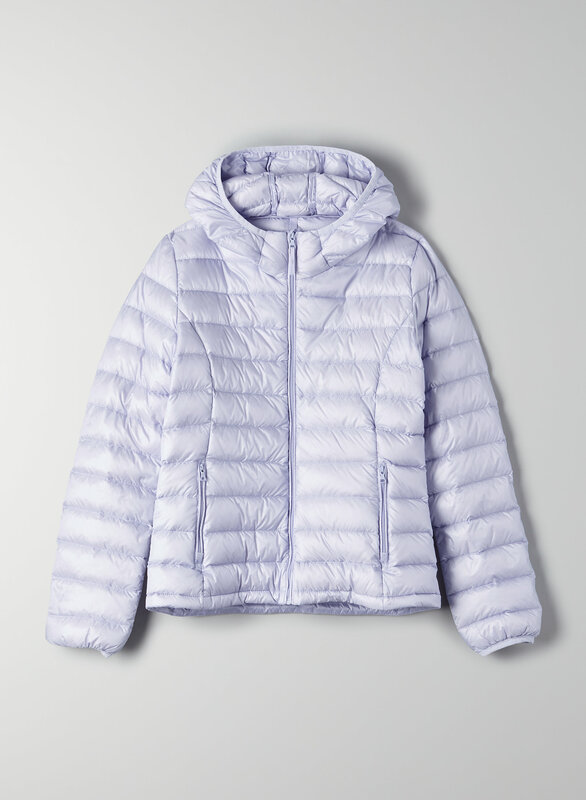 So good for those days where you just need a light jacket! It’s not super warm so I wouldn’t recommend it on its own in the winter, but perfect for the spring, summer, and fall! I would size up if you want to be able to wear thicker layers underneath it. This down is very light. The orange color is great for winter. I wanted a lighter sporty type jacket for those cooler but not cold Winter days. When I first got it I must say I was skeptical that it would be warm enough, but I was pleasantly surprised! I love this jacket it is well made, stylish and practical. I plan on getting another one in a different colour. 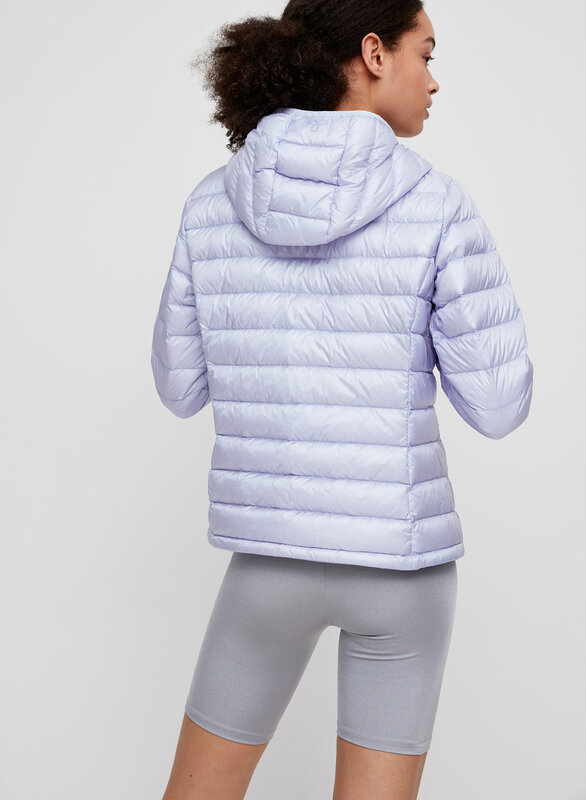 This little jacket is perfect for walking the dog and extra warm with a sweater underneath it. So lightweight and comfy that I ordered another !! Really like the shape and weight. Runs small so I won't gain any more weight this holiday season! Convenient, warm and packable. Fit is a bit too close to the body. Second time buying this coat now because I love it , super thin but warmth is definelty there ! fits in any purse when st mall and don’t want to wear it any longer , and can wear this walking from class to class . Only thing is I find it fits a little bit tight , especially f you want a sweater under neath ! The Botanie Puffer is a great jacket. It’s light and airy but it still keeps you warm. My only concern with the item I was sent is it seems to not have been sewn very well. Whenever I wear it bits and pieces of the goose down get all over my clothes. Again, the jacket is great and I must say I don’t regret the purchase! Love the weight of this jacket - so far has been warm enough in 40 degree weather with a good sweater and scarf. I've even layered this under a wrap wool coat and it was super cute. My only thing is, the zipper seems like it's plastic which may not last as long as the rest of the coat and I wish the pockets had fleece lining for your hands!Fit was a little snug but I tend to like my outerwear tight instead of loose so I kept the xs. If I get a second color, I'll consider getting the small. I only wear size small and this small is way too small. Super light! love to just pick it up, put it on & go ! I love this jacket. I bought this jacket in the wine colour and it looks so good. If you’re between sizes, I’d size up (especially if you want to layer).